2014 Leader of gold/platinum nugget collecting expedition to Germany, Switzerland and the United Kingdom (1.7.-21.9.) involving 12 participants; samples from 25 individual sites were obtained. 2013 Leader of gold/platinum nugget collecting expedition to arctic northern Finland (30.7.-18.8.) involving 6 participants; samples from 10 individual sites were obtained. 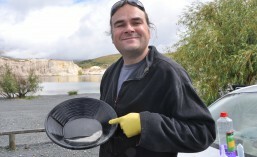 2013 Leader of gold nugget, soil and sediment collecting expedition to southern and alpine New Zealand (3.7.-18.8.) involving 5 participants; samples from 25 individual sites were obtained. 2012 Leader of gold and platinum nugget collecting expedition to central Brazil (Minas Gerais) (15.11-16.12.) involving 5 participants; samples from 9 individual sites were obtained. 2012 Leader of gold nugget, soil and sediment collecting expedition to southern and alpine New Zealand (4.11.-12.11) involving 4 participants; samples from 3 individual sites were obtained. 2012 Co-leader with J. Brugger and R. Bottril of osmiridium/platinum/gold nugget and soil collecting expedition to Adamsfield, Heazlewood and Wilson River (30.1.-9.2.) involving 9 participants; samples from 30 individual sites were obtained. 2011 Co-leader with J. Brugger of uranium mineral, soil and regolith collecting expedition to Arkaroola, Flinders Ranges, Australia (18.5.-26.5.) involving 7 participants; samples from 40 individual sites were obtained. 2010 Leader of platinum/gold nugget, rock, regolith, soil and water sampling expedition to Fifield, NSW, Australia (2.5.-12.5.) involving 2 participants; samples from 200 individual sites were obtained. 2007-14 Leader of seven expeditions (5-10 days) to the Prophet Gold mine and surrounding area near Kilkivan, Queensland, Australia, involving up to five participants. 2008 Co-leader with J. Brugger of a soil, regolith water, gold nugget collecting expedition to the Granites gold province, Tanami, Northern Territory, Australia (29.9-11.10) involving three participants; samples from 50 individual sites were obtained. 2008 Co-leader with J. Brugger, of a soil, regolith water, gold nugget collecting expedition to the Lawlers Gold province, Western Australia (20.9-20.10) involving three participants; samples from 50 individual sites were obtained. 2008 Leader of a soil, regolith, water, gold nugget collecting expedition to the Victorian Goldfields, Victoria, Australia (27.1-5.2.) involving three participants; samples from 70 individual sites were obtained. 2007 Leader of a soil, regolith, water, gold nugget collecting expedition to the Tomakin Gold Mine, NSW, Australia, (7 days) involving two participants; samples from 30 individual sites were obtained. 2003 Leader of a soil, regolith, gold nugget collecting expedition to the Peak Hill Gold Mine, NSW, Australia (10 days) involving one participants; samples from 50 individual sites were obtained. 2002-03 Leader of a soil, regolith, gold nugget collecting expedition to the Palmer River, Qld, Australia, involving two participants; samples (2 x 12 days) from 120 individual sites were obtained. 2002-03 Leader of 10 soil, regolith, plants, gold nugget collecting expedition to the Tomakin Gold Mine, NSW, Australia, involving two participants samples from 120 individual sites were obtained.